Do you have a child aged three or four years old and looking for a small class to get a jumpstart on his/her educational well-being before starting Kindergarten? 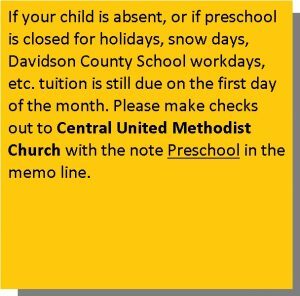 If so, Central UMC Preschool is the place you will want your child to be! Our class for three and four year olds meets on Tuesdays, Wednesdays and Thursdays from 8:00 am – 11:30 am, which is a three-day schedule for your child’s educational learning benefit. Interested in applying to our Preschool Program? 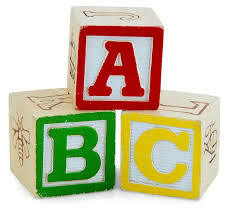 Simply complete the following preschool application and submit to the Church office or mail. If you have additional questions, please contact the church office at 336.859.3502. → Food allergies should be submitted in writing at the beginning of the year and on the application form. → Tuition due on the first of each month. (monthly fee of = $150). → A $25.00 registration fee must accompany each application. → Registration fees are non-refundable. Registration is required each school year. → Calendar: We follow the Davidson County school system calendar except for our first day. Our first day is the first Tuesday after Labor day, and closing the last Thursday in May.